The Green Bay Packers have been looking for an established workhorse to line up in the backfield ever since the departure of Ahman Green. I understand there have been guys like Ryan Grant and Cedric Benson, but neither of these guys could stay healthy enough or were built to be the 20+ carry a game type of back they needed. This was an important part of the Green Bay prolific offense that needed to be found and that is exactly what they did this year. 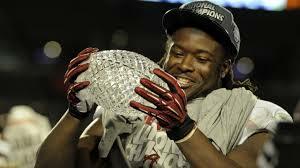 The Packers selected running back Eddie Lacy in the second round of the 2013 NFL Draft as their missing piece to the puzzle. The former Alabama star and MVP of the BCS National Championship was picked to shoulder the teams rushing attack, which is something he has shown he can do up to this point. He has been nothing short of brilliant so far and leaves us clamoring for more. The question surrounding Lacy for his whole career was durability and stamina. He has shown in his short lived NFL career, that neither have been or will be an issue going forward. On the way to proving the critics wrong, he has carried the ball for 20+ carries in 7 out of 11 games for 807 yards. If that doesn’t breathe durability, I don’t know what does. Lacy was named the incumbent starter from Day one (1) and has the whole NFL looking at his dust from the rear. As you look at the numbers he has amassed over the first 12 weeks of the season, 197 attempts for 806 yards and 6 TD’s, you can’t help but be enamored with the prospect of his future. Eddie was the consensus, pre season Offensive Rookie of the Year pick and is showing why he was everyone’s first choice. When Aaron Rodgers went down to a fractured collarbone against the Bears in week 9, the Green Bay Packers knew they needed to turn to the rookie for support and a boost on the offensive side of the ball. Lacy has proved to be able to show his own beast mode, ala Marshawn Lynch, and rack up yards with pure strength and reckless abandonment. 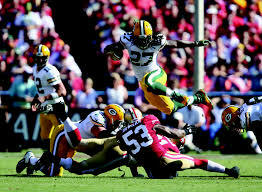 Over the last 3 weeks, Lacy has proved to be the man they can count on to lead them to victory. We may be witnessing the beginning path to stardom as he is developing right before our eyes. For example, this week Lacy has acknowledged watching Adrian Peterson on film, in order to get a feel of how he continues to run hard and pound the rock. Along the way to having a great NFL career, you must always learn how to be a student of the game and respect the ones who have earned it. If after week 12, in his first NFL Season he already gets it, well then he is well on his path to greatness. Next Next post: Will the Eagles soar into the Playoffs?